Great Smoky Mountains National Park has over 150 maintained hiking trails, offering more than 850 miles of hiking. Here’s our guide to the Smoky Mountain trails and some of the best Smoky Mountain hikes, along with a Smoky Mountains map of the trails. Enjoy your hiking in the Smokies! There are many sights in Great Smoky Mountains National Park that can only be viewed by hiking to them. Fortunately, there are plenty of day hikes that offer rewards in waterfalls, old forests and mountain views. There are also lots of less well known trails that are short, maintained for their extreme beauty, and some that are really easy, with even a couple that are suitable for strollers or wheelchairs. The Park Rangers have done a superb job of enabling access for everyone, in what is one of the very few national parks that don’t charge admission. Park trails range from paved nature trails to campground walks, from mountainous terrain to quiet meadows and back country territory. They wind through deep forests, along high ridge tops, and beside rushing streams. Trails range from easy to strenuous, and it’s important not to over-estimate how fast you can travel on foot. The national park’s website offers several different maps of the Smoky Mountains, including campgrounds, roads, historic places, and many other attractions and features. 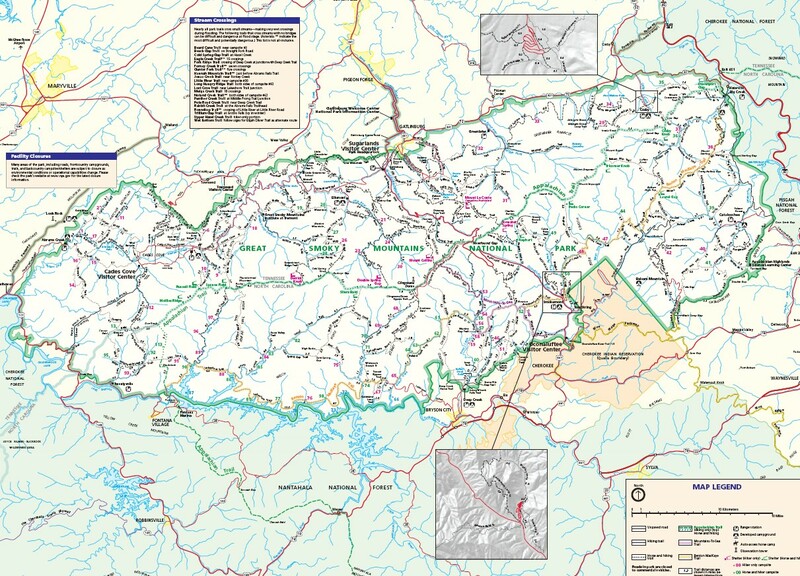 For a trail map, follow this link to view or download this Great Smoky Mountains National Park map of trails. Appalachian Trail from Newfound Gap parking area to Charlies Bunion. The Alum Cave Trail hike to Inspiration Point is a moderate hike that most fit people with good clothing and footwear can do. It’s 1.8 miles in each direction, and going is a fairly gentle climb through rich old forest with great views of the surrounding mountains. Andrews Bald is a great place for a picnic, a grassy meadow high in the mountains. It’s a short, moderate hike from Clingmans Dome, with a fantastic view. See more on Andrews Bald. Rainbow Falls is an 80-foot waterfall, a more strenuous hike, about 2.6 miles from the trail head, with a further 4 miles taking you on to LeConte summit. The views from Mt. LeConte are worth the hike to get to, especially from Cliff Tops, one of LecConte’s four peaks. See some pictures and more information in our features here, here and here. Most trails exist only to go from one location to another, which means allowing time to turn back and return to where you started. But there are some looping trails in the park, and this primary resource page at the Smoky Mountain Hiking Blog lists 15 of them for us! One alternative to the loop trail is a guide or shuttle service that will meet you at your destination and take you back to your car, or even resupply you along the way. See our article on A Walk in the Woods. This service is also useful if you’re physically challenged or new to hiking and want to start off easy. The service offers walks as mild as a stroll along the river in Gatlinburg, pointing out the natural sights. They also offer driver-guides to take the wheel in your vehicle, which lets someone else do the driving on busy roads such as Cades Cove, while you do the looking and filming. One of the organizations that helps protect and preserve the beauty of the Great Smoky Mountains is Friends of Great Smoky Mountains National Park. The Friends help raise funds for public awareness projects, volunteer efforts, and educational programs. Click to their site to learn more about the organization, buy a Smokies license plate, and find out how to donate time or money to the GSMNP. Weather changes quickly in Great Smoky Mountains National Park, especially if you’re changing elevations, and hikers above all people should be prepared for this. When you hike in the Smokies, Park officials advise hiking during daylight hours only and caution hikers to always stay on designated trails. During summer months, be sure to take along plenty of water, and in any season, a sturdy pair of hiking shoes is helpful. You can choose from self-guided trails, waterfalls, back country trails, and balds. Self-Guided trails have numbered stakes along the trail keyed to leaflets available at trail heads, which describe points of interest along the way. A paved trail built in 1993 to accommodate visitors with disabilities. The level trail leads to distinct forest life zones, a river, and the remains of early dwellings from before the park’s creation. Special communications aids for appreciating the natural settings are available at the Sugarlands Visitor Center. The trail is great for visitors with mobility and sensory impairments as well as older visitors and families with children in strollers. It includes the natural arch of Arch Rock, Inspiration Point, and the Alum Cave Bluff. Inspiration Point offers a spectacular view of the West Prong of the Little Pigeon River’s upper basin. The bluff resulted from Confederate mining of saltpeter during the Civil War. This trail continues to Mt. LeConte, and its beautiful viewpoints. Round trip distance from the parking area to LeConte is 10 miles. A grove of old-growth deciduous trees. This trail follows a portion of Maddron Bald trail to the Albright Grove loop, which passes through one of the largest and most impressive stands of virgin poplar in Eastern Tennessee. This is Cades Cove’s easternmost trail. It begins in the Cades Cove picnic area. The trail follows Anthony Creek to its headwaters. After three miles the trail reaches back country campsite #9. After another mile the path merges with Bote Mountain Trail. Destinations include Spence Field, the Appalachian Trail, and Rocky Top. Rocky Top holds one of the Park’s best vistas. This is a great trail for families. It is less than one mile past the Cades Cove Visitor Center, and begins along the loop road. The two mile loop hike takes about an hour. A brochure explains more about the Cove’s cultural and natural history. The Back Country trails are for the more experienced, adventurous hiker. They offer an in-depth, backwoods experience. This trail takes you by some old growth forest, picturesque streams and falls, and the remains of early settler’s home sites. It is a steep climb to two rock spires 4,730 feet in elevation. From the top they provide a spectacular 360-degree view. Climb this trail through the changing forest of Spruce Fir, Fraser Fir, and Red Spruce. The Mt. Sterling trail will emerge atop a truly magnificent pinnacle where a park fire tower stands. The steep terrain can be slick in snow or rain, or on fallen leaves. The excellent views of the Fontana Lake and the Smokies are worth it. Enjoy mountain streams and wildflowers while hiking on this trail. Finally, the Balds are mysterious treeless areas high in the mountains. Some speculate that they were caused by ice storms, insects, woolly mammoths, dry wind or fire. This hike heads down slope to a bald. Excellent views open to the south, toward Fontana Lake, and in spring the azalea explode with color. This trail-head is not accessible by car from 12/1 to 4/1. The Cove’s most scenic, but strenuous, hike is the Gregory Bald Ridge Trail. The trailhead is on Forge Creek Road. Follow Forge Creek Road two miles. It ends as a parking lot. The trail to Gregory Bald begins here. This tough trip gains 3,000 feet in elevation. Old growth forest, with eight-foot diameter tulip poplars, and the 10acre bald highlights this trail. This trail features Bote Mountain trail, Spence Field and outstanding views. This steep and strenuous trail features Rocky top and panoramic views.